The Music program at St Thomas School is committed to ensuring that all students are provided with the opportunity to access music consistent with their needs and talents. The program is designed to promote music appreciation through engagement in a wide variety of musical experiences and styles, as well as the development of basic music reading and performance skills for all students. Religious music plays an important role in choral singing at school. The students prepare for Mass using a variety of contemporary hymns and songs. 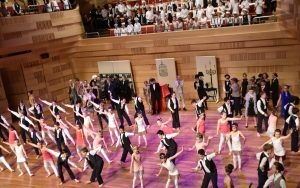 All the students are prepared for an end-of-year school concert or musical which provides them all with an opportunity to perform in front of a broad community audience and to showcase their talents in the performing arts of Drama, Dance and Music. Students can elect to participate in the band program from the beginning of Year Three. Many of our students take advantage of this extra curricula music opportunity, receiving instrument tuition and progression through the Junior and Senior Band as their skills develop. Many students also participate in the Junior and Senior Choir program and the recorder group, both of which are available to students from the beginning of Year Two.